Don't let the silly, generic (if admitting, cool in lame kind of way) cover art fool you, Master Control is one of the finest American power metal albums ever recorded. It's a great combination of early power metal and thrash, coming together to create an album too epic and melodic to be thrash, but a bit too punk to be real power metal. It's an album that wanders the proverbial middle ground between the two genres, walking the tightrope so to speak, and it does so wonderfully. 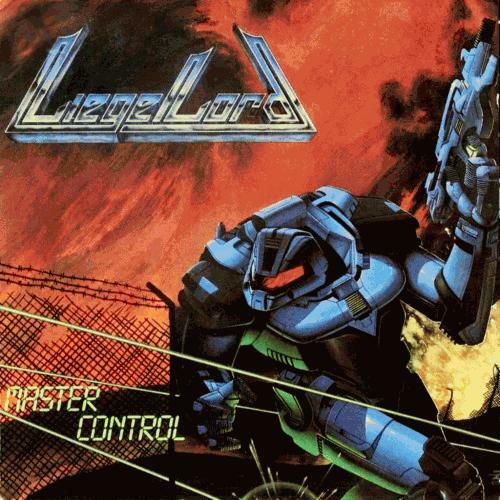 Liege Lord build upon the potential their previous two records showed and exceed what quality those two albums foreshadowed. The songs here are all well written, each with riffs that are unique enough to stand out, yet similar enough to create a cohesive album. Unlike many power metal albums, it feels like there are ten different songs here, rather than 10 takes on the same generic riff. Additionally, they didn't make the mistake of "front-loading" the album. Every song here is good, but in my opinion, it ends off much stronger than it begins. Again, that's not to say that the first couple of songs are bad, just that it gets better from that point. While the riffs are great, a few songs have fairly weak choruses. They aren't awful by any stretch of the imagination, but after such great riffs, it's hard not to feel a bit let down. Fortunately, this is an issue that only effects a few of the songs. Most songs have choruses that will get your head-banging just as much as the riffs. The biggest strength for Liege Lord are their vocals. Joe Comeau does a FAR better job than previous vocalist Andy Michaud. Michaud had a tendency to sound like King Diamond if Kind Diamond sucked. Comeau's vocals compliment the music nearly perfectly, matching their power metal overtones with subtle thrash in the back ground. He sounds like Bruce Dickinson hyped up on drugs, vocals that are both epic and rough. The lyrics here are pretty much what you'd expect from a late 80's power metal band. This was before fantasy took over the genre, but the lyrics still match the antithetic feel of the music. They almost all have to do with war or violence of some kind, not that that's a bad thing, just that it's what is to be expected. Nothing here is BAD, just nothing that breaks the mold or really stands out. If you want great lyrics, this isn't the place to find them, but if lyrics aren't a major concern, this'll be fine. Not bad, not good, just average. Musicianship is all over the place. As stated earlier, the vocals are amazing here, and the guitarist(s") does a great job too. However, the drumming is painfully boring, doing little other than provide momentum for the rest of the music. Yes, that's a drummers job, but it's done so generically here it hurts. The basswork could be amazing for all I know, but no one will ever know because it's inaudible. This is either a mixing issue, or the bass follows the guitar so closely that the two are indistinguishable. Regardless of reason, the bass NEVER stands out, not for a moment. While those two elements do detract from the overall experience, they do little to offset the greatness of the vocals and guitar, who are both good enough to make most listeners forget how garbage the drumming is and keep them from wondering where the bass went. The production on Master Control SEEMS to be fine. The guitar and vocals are great, both are given the volume they need and a nice layer of grime is added on top to give them a bit of extra bite that really helps give the music a bit of needed aggression. The drumming is turned down pretty far in the mix, which is good, as it keeps the listener from thinking about how generic the drums are. The only real downside is that the production could be the reason the bass is basically nonexistent. If it's the musician's fault, then the production is nearly perfect, however if the production is to blame, that would serve as a pretty major knock against the production job. What is there is good though, so it does alright either way in my book. Overall, Master Control SHOULD have been big. It's too heavy to be a mainstream success, but I'm a little surprised that it didn't get big within the heavy metal subculture. It hits all the right notes in my book to at least deserved being remembered, it's also better in my mind then a lot of so called classics from this time. It's an album that's worth your time, and likely your money. I can't say it's worth tracking down or spending a lot of money on, but if you find it in a record store for $15 it's worth it. Album is so damn good. The guitar work is some of my fav from the 80s. Yes! Great choice for review. The album cover is great for '80s standards, there is far worse art from that decade. Because Sput doesn't appreciate good '80s metal. I mean you have Bruce Dickinson-esque vocals, forward thinking guitar work that even rivals today's players (not to mention that godly guitar tone), riffs, sweet production, what else do you need? Yeah it's a great album but I haven't jammed it in a long time. If you're up for some Maiden-influenced obscure '80s metal (which I know you are), check out ARTCH - Another Return. I only checked them because they were from Norway, which is surprising by itself considering the era and music they played, and I was pleasantly surprised. "Overall average should be at least a 4.2 first of all..."